RE-PURPOSING OUR RECYCLED EGG CARTONS FOR SEED STARTING. We love spring in New Hampshire as the trees begin to bud, the grass turns green, and the flowers begin to bloom. In our family gardening has become a favorite spring and summer activity because it is something that we can do together as a family. 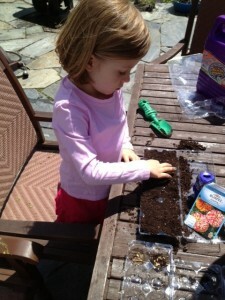 Our kids love playing in the dirt and soon we will have a bounty of delicious vegetables to add to our family dinner table plus the kids love to see the vegetables grow from seeds that they have watered and cared for. Another fun way to get your children involved in planting a garden is to create miniature greenhouses with them using our recycled PET egg cartons. Our cartons make the seed starting container. The other day we enjoyed planting Zinnia seeds together in our mini greenhouses and will watch and wait for the seeds to sprout so that we can add some bright and sunny colors to our yard. Have you ever used our egg cartons to start seeds?